Michigan City is a city in LaPorte County, Indiana, United States. For shopping fun, head to Albanese Candy Factory or Shipshewana Auction & Flea Market. 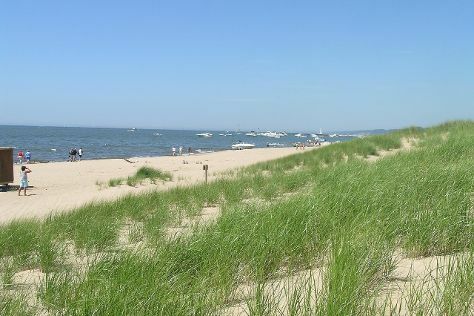 Your itinerary includes some good beach time at Oval Beach and Silver Beach County Park. Change things up with these side-trips from Michigan City: 12 Corners Vineyards (in Benton Harbor), Shipshewana (Davis Mercantile & Dutch Creek Farm Animal Park) and South Bend (University of Notre Dame, Grotto of Our Lady Lourdes, & more). The adventure continues: revel in the low prices at Lighthouse Place Premium Outlets, admire the natural beauty at Krider Nurseries World's Fair Gardens, don't miss a visit to Whirlpool Compass Fountain, and identify plant and animal life at Jasper-Pulaski Fish and Wildlife Area. To see more things to do, ratings, where to stay, and more tourist information, read our Michigan City journey planner. Dayton to Michigan City is an approximately 4.5-hour car ride. You can also fly. The time zone changes from Eastern Standard Time (EST) to Central Standard Time (CST), which is usually a -1 hour difference. Traveling from Dayton in June, plan for little chillier nights in Michigan City, with lows around 56°F. Wrap up your sightseeing on the 16th (Sun) early enough to travel back home.